1. Heat the oil in a small frying pan and gently fry the salmon, skin side down for 7-8 minutes, turning once halfway through. 2. Meanwhile, heat the spelt pouch according to pack instructions and stir in the beetroot salad. 3. 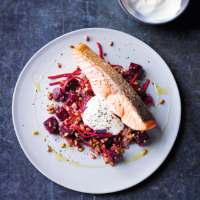 Serve topped with the salmon and a dollop of yogurt.